× Success! Thank you for your details. We will contact you shortly. The Perfect Gifting Solution for Weddings, Anniversary's, Birthday's for your family and friends. Ravine Hotel is introducing our New Gift Card. With this Card the recipient can enjoy stays and many more indulgences at Ravine Hotel. The Gift Card/ e-Gift Card can be purchased for variable denomination ranging between minimum value of Rs. 5,000 and maximum Rs. 50,000 on Ravine Website or at Ravine Hotel Reception Desk. This Gift Card is valid for a period of 12 months from the date of purchase. This Gift Card cannot be clubbed with any other offer, cash back discounts etc. This Gift Card can be used only for direct booking and reservations, any 3rd party reservation and booking can not use this Gift Card as mode of payment. This Gift Card is valid for partial redemption during the validity period till balance is exhausted. Multiple Gift Cards (upto 3) can be combined and used on 1 transaction. This Gift Card cannot be cancelled, refunded, returned or replaced. Valid Gift Card in its original form has to be presented at the time of availing a service at Ravine Hotel. Any unused balance on the Gift Card will expire after one year from the date of issue. This Gift Card cannot be transferred for balance value or redeemed for cash. Ravine Hotel will not be responsible if the Gift Card is lost, stolen or destroyed or used without permission. The Gift Card can be used for deposit, advance purchase or to secure or confirm a reservation/room booking. This Gift Card does not gaurantee advance booking/reservation. Bookings and reservations is subject to availibity, please check with the booking department at the time of the booking request. Any defaced, spoiled or cancelled physical Gift Card is termed invalid and shall not be accepted. Any dispute shall be referred to Ravine Hotel, and the decision of Ravine Hotel will be final. Ravine Hotel reserves the right to amend these terms and conditions from time to time. Any change in these terms and conditions can be viewed on our website. Non-receipt of Gift Card post 7 days of receipt of dispatch confirmation has to be reported immediately or else Ravine Hotel will not be liable for the misuse of the Card. The Gift Card is for use against your total bill, not only for for spa, and restaurant. GST will be charges as per the services renders at the time of presentation of this Gift Card. 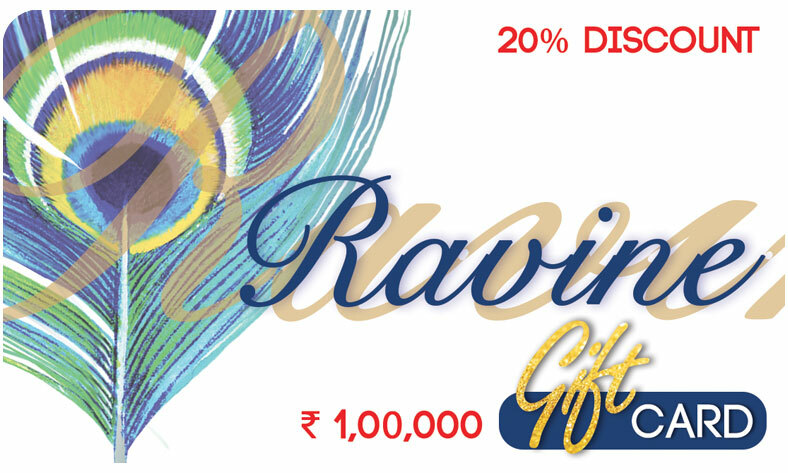 Any purchase of Gift Card of the value of Rs. 10,000 or higher, will require the purchaser to submit a copy of their PAN Card.